9. Sturge Moore (1870-1944). MedEa. In Tragic Mothers. London: Richards, 1920. ‘My friend Mr. W. B. Yeats asked me to try my hand, having himself achieved brilliant success, in this new form of drama, independent of stage and scenery and suitable for chamber presentation. The idea had come to him while reading about the Japanese Noh plays.’ Sturge Moore ca. 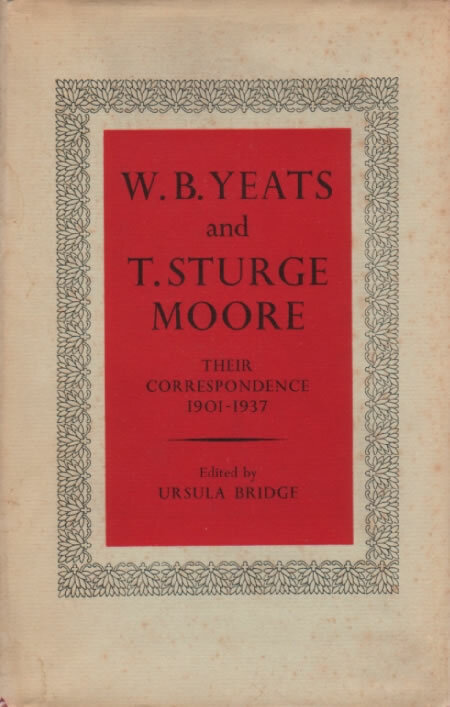 1926 ( ); Moore’s correspondence with W. B. Yeats. Moore’s most successful play includes a note after the list of characters that allies the work to Yeats’s adaptations of the nô: ‘My friend Mr. W. B. Yeats asked me to try my hand, having himself achieved brilliant success, in this new form of drama, independent of stage and scenery and suitable for chamber presentation. The idea had come to him while reading about the Japanese Noh plays’. Like AT THE HAWK’S WELL (BL12), THE DREAMING OF THE BONES (BL14a), THE ONLY JEALOUSY OF EMER (BL14b), and THE RESURRECTION (BL28), MEDEA employs ‘curtain bearers’ who function as a chorus, and whose unfolding and folding of a cloth, or ‘curtain’ here, demarcates the opening and closing of the ritual space and action. Also, like THE DREAMING OF THE BONES the action revolves around the meeting of a central character with the spirits of the dead, in this case Medea and the ghosts of Mermeros and Pheres, the sons she had murdered. As is often true of the nô itself the play rises to its climax with the dancing of the passions of the central character, though here the dancer is Medea, seeking pardon for her crime, and not the ghosts seeking release from the passions that condemn them to the earth. Perhaps not too much should be made of these similarities, but as in the best of Yeats’s plays, the treatment of tragedy has been mitigated by the classical Japanese form, and thereby achieves effects unknown on the European stage until this ‘idea’ from the ‘Japanese Noh plays’ had passed from the authors of the nô through the generations to Umewaka Minoru (Ap), from Umewaka to Hirata (Ap) and Fenollosa to Pound, and from Pound to Yeats. Moore’s work is among the more successful manifestations of this passage of classical Japanese understandings and techniques to the English stage. Later Moore plays adopt techniques from Yeatsian ‘nô’, but none so much as this work, and none are related so closely in mood to the Japanese progenitor. Moore’s biographer, Frederick Gwynn (Sturge Moore and the Life of Art [Lawrence: U of Kansas P, 1951]), noting Moore’s ‘idealism’, suggests that ‘even [Moore’s] exotic Noh plays teach lessons in Occidental morals’, and refers to a late play, PSYCHE IN HADES (in Mystery and Tragedy, 1930), as ‘a wordy Noh play’, a phrase that Miner (A25), perhaps not altogether fairly, suggests describes MEDEA as well. See also A32, BC29, 32b, 43, BL47, 129, and 218.